Last month I spent a week out at Los Alamos National Laboratory vaporizing things with a high powered laser. Now, as I drown in data that I collected out there, I thought I’d take a moment to talk about lasers. I hate to burst your bubble, but working with lasers, although very cool, is not as showy as most sci-fi depictions. To help understand why, let’s first talk about how lasers work. The word laser is actually an acronym for Light Amplification by Stimulated Emission of Radiation, and that actually sums up how they work quite well. There are lots of different types of lasers these days but they all share a few common characteristics. First, you need the “lasing medium” – that is, the stuff that will give off the light. The first lasers used artificial ruby crystals, but now there are lasers that are based on everything from CO2 gas to organic dyes to various semiconductors. The laser I use for my research is a Nd: YAG which stands for Neodymium-doped Yttrium Aluminum Garnet crystal. Ok, so we have a “lasing medium”, now we need to make it shine. Things give off light when they have electrons in high energy levels jumping back down to lower energies and getting rid of the excess energy as photons. In a laser, the goal is to get something called “population inversion”, meaning that there are more electrons in excited energy levels than there are in the ground state. This is typically done with a flash lamp in a process called “pumping“. By shining very intense light on the lasing medium, the electrons all get excited and the laser is ready to, well, lase. Diagram of a ruby laser from HowStuffWorks. Of course, the goal of a laser is to have a nice narrow beam, but if you just have a lump of stuff with excited electrons, the light will be given off in all directions. A fluorescent bulb is a good example of this. A lasing medium acts in much the same way, shining a diffuse light in all directions, unless we do something to it. The secret is to place it between two mirrors, one which reflects all light, and one which reflects only some of the light that hits it. Initially, the atoms in the lasing medium give off light in all directions, but some of those photons will end up traveling along the laser, bouncing back and forth between the two mirrors. Here is where the laser really starts working. It turns out that when you have photons of a certain energy traveling along through a bunch of atoms with excited electrons that have the same energy, you get “stimulated emission“. The first photons cause the electrons to jump down and emit identical photons. And I do mean identical. Yes they have the same energy (and therefore the same frequency/wavelength/color), but the new photons also have the same phase, polarization and direction as the initial ones. They are completely indistinguishable at the quantum level. As you might expect, this stimulated emission leads to a chain reaction. Each photon of laser light can stimulate new photons to join it. Since one end of the laser is partially transparent, the result is a narrow beam of light made up of identical photons: a frickin’ laser beam! Wonderful. Now that we understand how they work, I want to address a few misconceptions about lasers in science fiction and popular culture in general. 1. Laser beams are visible. With a laser, the idea is to have all of the light going in the same direction, right? That means that if you can see the laser beam from the side, as shown in this picture from Star Trek, and in pretty much every depiction of lasers ever, then something isn’t right! The light is being scattered out of the beam. If you’ve ever used a laser pointer you know that even though it gives off visible (usually red or green) light, you just see a dot where it is pointing. Now, if you shine it at someone who is smoking, or if you use it outside in the fog, or in a dusty room, you can see the beam because the light is reflecting off of particles in the air (smoke or water droplets or dust). So, yes sometimes visible lasers in air are plausible because there could be stuff in the way, but visible lasers in space? No way! There are some other caveats to this also. Not all lasers use visible light! The Nd:YAG that I use for my research and the similar laser used by ChemCam emit infrared light. It is completely invisible, no matter what. This makes it incredibly dangerous to work with lasers like this, especially when first lining up the optics, because you can’t tell if the laser is being reflected around the room! Just because these lasers are not visible doesn’t mean they can’t destroy your retina in a millisecond, so we wear special protective goggles designed for the specific wavelength that the laser emits at all times when the laser is on. *Yes, I know, some sci-fi explains this by invoking pulses of plasma and not actual lasers. That’s a whole different can of worms with its own issues. Suffice it to say that most people *think* those blasters, phasers, etc. are supposed to be lasers, so I’m debunking that misconception. That’s not what they sound like. I know. I’m sorry. Low powered lasers don’t really sound like anything. And can you imagine how annoying it would be if they did? At the grocery store checkout: pew pew pew! Using a CD or DVD player: pew pew pew! 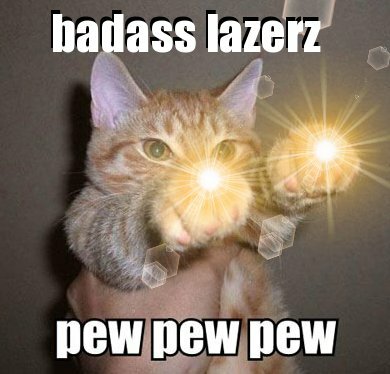 Laser pointer: pew pew! The popping noise is essentially the same thing as thunder: a rapidly expanding ball of plasma causes the air to be compressed in a shockwave. Our laser plasmas are tiny, so they just make a little noise. Lightning bolts (plasma formed by electrical discharge) are rather larger, and so is their noise. Many of my experiments are done zapping rocks inside a vacuum chamber, and it’s always fun to hear the noise fade away as we decrease the air pressure in the chamber. They’re really not that great. There are a lot of issues with using lasers as weapons. First of all: the optics. 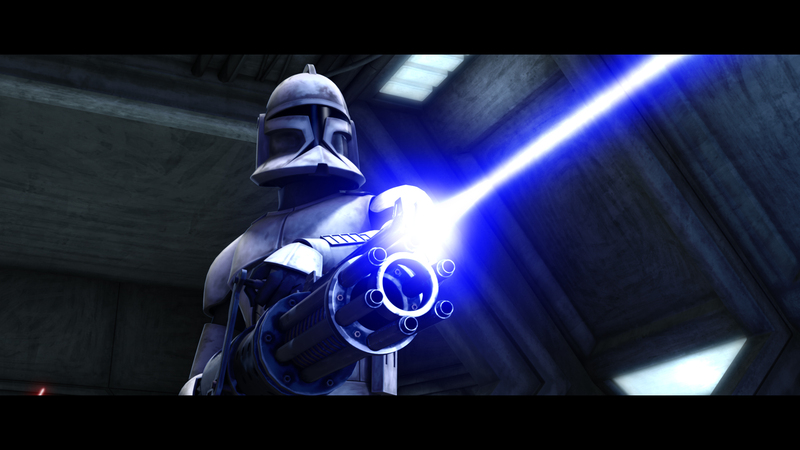 For a laser to be useful as a weapon, you would have to focus the light as tightly as possible on the target. De-focus at all, and you might still blind them, but there won’t be much vaporization going on. The precision required for the optics to do this makes a hand-held laser really impractical. The slightest bump or wiggle and all of a sudden your gun is a high-powered flashlight. There’s also the issue of air. Anyone who has looked through a telescope or out over a parking lot on a hot day has seen the shimmering mess that the air can make of an otherwise clear image. Now imagine trying to shine a tightly focused beam of light through that mess and hitting a target. Not an easy task. The military has worked on this to some extent with adaptive optics used for giant plane-mounted anti-missile laser, but it is a significant problem. The air poses another problem: it absorbs light. In fact, a high enough powered laser can cause the air itself to break down into a ragged line of plasma. I’ve seen this in the lab and it is awesome. The problem is that plasma is full of free-flying electrons, so it absorbs light. 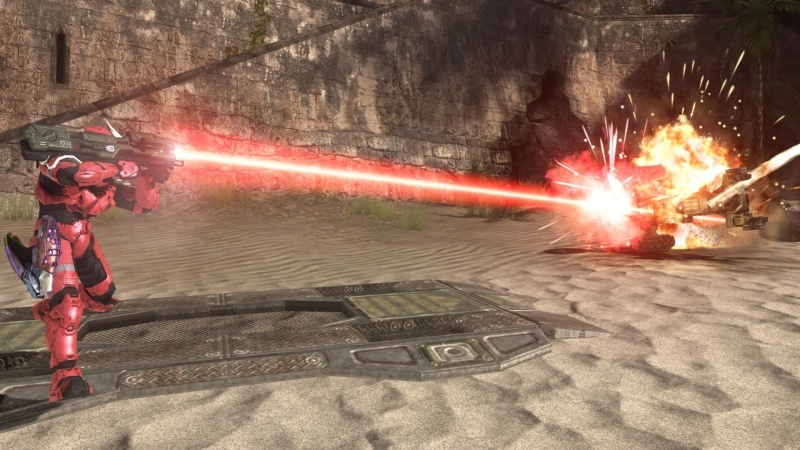 A laser strong enough to use as a weapon would also be strong enough to turn the air to a plasma, which would then block the laser from hitting its target. One way around the plasma problem is to use a pulsed laser. As long as the pulses are timed so that the plasma has dissipated before the next pulse is fired, the plasma is not as much of a problem. I mentioned lightning earlier and that’s relevant here. There is a way to make use of the “plasma issue”, because plasmas conduct electricity. So in theory it would be possible to use a laser as a long-distance taser! 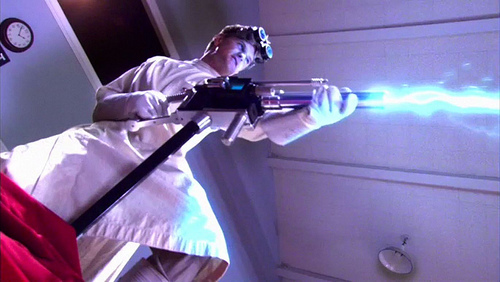 The laser would first create a conduit of plasma out of the air, and then with a high enough voltage, an electric shock could be send down the plasma to the target. This would not be a subtle weapon: at this point the lightning analogy is not really an analogy anymore. It would basically be a lightning gun, and would make a noise to match. I thought I was being really clever when I thought of this, but it turns out I’m not the first: the US military has experimented with them. Another problem with lasers as weapons is the power source. It takes quite a lot of power to make a laser capable of doing damage, and it would probably not be practical for a person to carry such a power source around. 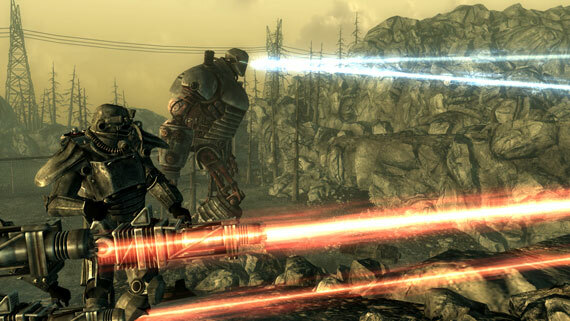 I’m playing the video game “Fallout 3” right now, and the energy weapons use things called “microfusion cells” for ammunition. Right now, we don’t even have power-positive macro-fusion cells, so bullet-sized fusion powerplants are not available yet. Finally, there is the issue of collateral damage. The thing with light is that it tends to reflect off of things. This means that anyone using a laser weapon better be wearing the appropriate protective eyewear or else their own target is going to blind them. Aside from the practical issues with blindness, the Geneva conventions also specifically forbid laser weapons that cause blindness (in other words, all of them). In my opinion, I highly doubt that lasers will ever be practical as pistols or rifles. Maybe as large mounted guns on tanks or something. But really, the most likely place for lasers as a viable weapon is space. Without air, the difficulties with plasma creation and turbulence are removed. The issue of power and optics remain, but I could plausibly see a satellite or space station with the stability and power to use a laser as a weapon. It might still be difficult to focus on a distant target, just due to the physical limits on the optics, but the advantage of near-instant travel-time might be of benefit when you’re aiming at a target thousands of km away, traveling at thousands of km per hour. This entry was posted on February 8, 2010 at 9:48 am and is filed under Ryan's Research, Science Fiction. You can subscribe via RSS 2.0 feed to this post's comments. Both comments and pings are currently closed. That is awesome. I don’t like coffee, but if I could make it like that I’d drink it anyway! One of them is tea! Any idea how to find out who those guys are? Very entertaining and educational post. Keep up the good work. I like the bubble wrap part. I work with an m60 a3 tank that uses a laser telemeter to measure distances. On a dark night I can see the red laser beam travel to the target. It happens at an instant but I can still see it travel to the target from its source. I can see it travel to the target much clearly with the night vision perescope at any given night. I have done this and tested as well as many of my friends. I argued that human eye shouldn’t be able to trace a laser beam traveling at the speed of light, but I myself have seen it many times. I am trying to find and explanation to this observation. Can a human being actually see something traveling at the speed of light, or am I just seeing the air the laser breaks down? Sorry I read this after my post… so this post is also shown after this. To start, I have no scientific background. That said, I was in a bar the other night and I noticed that I could see the laser light show like a star wars space ship going into warp speed or like bullets of light beams were being shot out… no I was not drunk. It was almost as if I could sometimes see the trailing end of the beams when they stopped. I have read that the speed of light is 186,000 miles per second (in a vacuum), so it makes me wonder what I was seeing. Can anyone explain this? Is it possible for the human eye to detect the beginning or end of a laser light beam like that or is there some trickery involved? This is one of the reasons I love Mass Effect, no frickin’ laser beams! Instead they use mass drivers, weapons that fire pieces of metal at hypersonic velocity. The slug fired from a Dreadnought’s mass accelerator impacts with the force of a multi-megaton nuke, and as such Dreadnought-class spacecraft are considered Weapons of Mass Destruction. Now how badass is that? Star Wars and Star Trek can shove their lasers where the sun doesn’t shine! In fact, the US Army is funding railgun experiments. The University of Texas at Austin has developed a railgun capable of firing tungsten armor piercing bullets with kinetic energies of 9 megajoules! Very wrong. I give you one decade before you see “Star Wars” style blaster firearms. Consumer electronics is already selling a 1W hand-held blue-LED laser which can burn cause a considerable amount of damage. In todays day and age, it would not be difficult at all to configure an array of these lasers to aim to one singular point, for target aquisition. this means that a large enough array, TODAY, could possibly vaporize little holes in anything approaching it. However you would be correct that TODAY this apparatus whouls be quite large… it is not neccessary to focus the total energy into one beam, just to collect all beams to one point. moving on, i see it taking only a decade before manufacturing has miniaturized this LED-laser system to the point where an entire array of LED-laser may only take up a few square inches of surface area. An opinion can’t be wrong. You may eventually turn out to be right, but based on my experience with lasers in my research, it is a lot more difficult than people appreciate to get a laser focused on a distant target, even if you could solve the problem of a reliable, long-lasting portable power source. It just depends on your definition of “distant target”. The vehicle mounted lasers currently being tested by the US military are designed for missile interception, so they have to work at a few hundred Km distance to target. Hand-held laser weapons would just need to outperform current ballistic hand-held weapons at their distance range to be effective weapons. An M16 rifle has an effective range of 550 mt. for a point target and 800 mt. for an area target. A really small fraction of the distances being worked in current vehicle mounted lasers. And I do think that a weapon whose ammo travels near-instantaneously and has no recoil to throw the shooters aim off, might easily outperform pistols and rifles. The problem I still see needing serious work for this type of weapon is dust. the air in a battlefield can get pretty opaque with all the explosions going around and everything, which could be a bummer for directed energy weapons, yet astronomy has shown us that using infrared you can “see through” the galaxy’s dust cloud, so there is an interesting research direction. Can infrared lasers “pass through” dust clouds? It seems to me laser technology has reached a point where had-held laser weapons are no longer a scientific problem, but more of an engineering one (no disrespect intended towards scientists). I agree, it’s definitely an engineering problem more than a science one at this point. The big vehicle-mounted lasers that are being developed used some really sophisticated adaptive optics technologies to account for atmospheric turbulence. Those may or may not need to be applied to firearm-sized lasers to make them practical. you also run into the problem of focusing the laser at the correct distance. Unless you are using a parallel beam that has a high enough energy density to ablate the target without focusing, you are going to need to do what ChemCam does and start with a wide beam that focuses to a point. That would mean that unlike projectile weapons, a laser weapon would need to calculate the distance to the target. Of course, maybe I’m being too negative and parallel-beam lasers with high enough power will be developed and used. I still think it’s going to be a long time before we have hand-held lasers capable of delivering an amount of energy to a target comparable to a bullet. You’re not quite right about the GC. Weapons that blind for the sake of blinding are banned. Weapons that blind incidentally in the process of killing someone/destroying something are permitted. IOW blinding a pilot on final approach so that he crashed his plane destroying it and killing himself would be legal. One of the planned upgrades to the F35 is a 100KW IR laser capable of destroying enemy aircraft by burning holes in them. We wouldn’t be doing this if it would be illegal to use. Sorry for this, my geeky trivia self is asserting! Granted, both of these “technologies” have their own issues with reality, but I think both were created because lasers weren’t suitable for some reason or another. I think 100 J is enough to seriously burn a human. It might not kill, but you might think of not getting another dose. Since a standard AAA NIMH Akku has more than 7000 J of capacity, you are able to produce these 100 J even at the bad effiency factor of lasers. Laptopakkus have more than 45Wh which is around 162 kJ. Fortunately the laserstuff is really expensive, so nobody builds a sniper weapon powered by a car batterie. Doing a quick back of the envelope calculation,an 8 gram bullet going at 1000 feet per second has an energy of 371 joules. So you’re right, 100J would certainly hurt. But you also have to worry about things like power: you need a battery (and capacitor, etc.) capable of discharging hundreds of joules instantaneously, and preferably doing so repeatedly in rapid succession. Just because you can fire once with energy comparable to a gun doesn’t put lasers on an equal footing if you then have to wait 5 minutes to charge up your capacitor again. I know that, but 99% of people who see Star Trek and Star Wars think that they are seeing lasers. And lets be honest: the people who invented “phasers” and “blasters” were really just coming up with different words for lasers. All the technobabble about plasma pulses and nadion particle beams is just an after-the-fact attempt to make up for the fact that they are inaccurate depictions of lasers. 1.Visible light lasers are visible in air because the laser light is refracted. The article says this. 3.Interesting, the GC doesn’t allow blinding with lasers and we have hand-held lasers in the field now that are designed to stop traffic by blinding the person coming towards the person holding the device. The GC probably doesn’t allow permanently blinding someone, which these hand-held devices don’t do. 4.Are the laser pointers really shooting lasers or are they just intense beams of light? The laser I remember was at least a couple of feet long and I was told it needed to be that long to bounce the light several times to properly line it up before it is shot out. 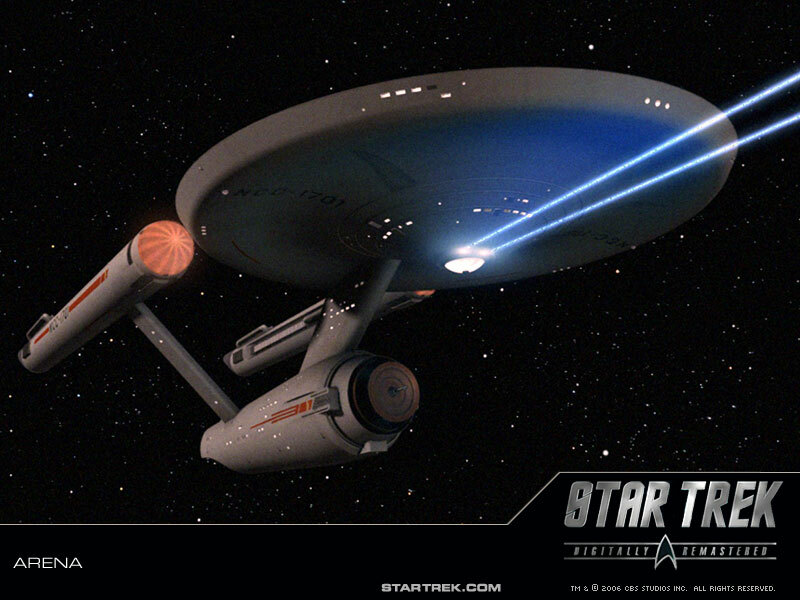 5.Neither star wars nor star trek claim to be using lasers. Yes, the people who don’t really care, think they do. Parts of the light saber are doable now, others aren’t. We can create magnetic fields that can hold plasma in a specific location. You can charge up the plasma so it lights up and has the energy to do what a light saber does. That can be done with a laser. If you set up two opposing magnetic containers and brought them together, assuming they are using the same polarity will resist each other. The magnetic beams would stop each other if you tried to put them together just like striking swords. (Opposite polarity would attract, the two beams would lock together, destroy each other, and the plasma would be released in a violent explosion. Suicide bombers attacking an unsuspecting light saber soldier would be possible.) Hand-held magnetic field generators don’t exist. We don’t have magnet fields narrow enough to be a sword’s width and strong enough to hold plasma. Dynamically creating boundaries for a magnetic field don’t exist. Plasma actually touching the material generating the energy to create the charged plasma would destroy the material. 1. Refraction is bending of light, like through a lens. What you mean is reflection or scattering. 2. The travel time of lasers is way too fast to be seen by the human eye. Most of what you’re saying in this comment doesn’t really make sense. For example, if you ionize the air along the path of the laser, it becomes an opaque plasma, not a vacuum. 3. Yes, that’s correct. You can dazzle someone so they can’t see well, but the GC forbids permanent blinding. This is why flashbangs are legal. 4. Yes, laser pointers are true lasers. Not to be confused with LEDs which are very bright but non-coherent. You can tell that something is a laser by looking at the spot – if it looks sort of “grainy” and the graininess changes a lot as you change your point of view, then it is probably a laser: the graininess is due to the interference between the identical beams of light as they scatter off the surface of the target. 5. See my above responses to the star wars and star trek claims. As for light sabers, those are even more far-fetched than laser firearms. Long ago (it seems) I worked with a home-made pulsed CO2-TEA laser – an original ruled grating as the output coupler. It was the first successful molecular process for separation of Uranium Isotope (target, a tailored molecule, Uranium Hexamethoxide). Anyway, not a bad article. The 10 micron IR from my laser, 1 – 10 Megawatts during its roughly 1 microsecond pulse width, was invisible. An alignment trick I used was to let it hit a piece of carbon paper, which made enough smoke so that a sparkling trail was made. Much as the optics hated this, that mother hurt . . . a lot. Focused, it caused the dielectric breakdown of air – which was more of a ka-pow in our case (louder than firecracker, but not a cherry bomb). Later, a commercial version, at 5x the power, was also a very capable cockroach eliminator – blew them to pieces, actually. For you see, pulsed laser weapons do their damage by rapid momentum transfer: a shock-wave generated on impact to a surface. For the weapon-o-philes, I interviewed once and was able to suggest countermeasures (at least for graphitic ICBM nose cones).